As chaos in the Middle East continues, President Obama and GOP presidential hopeful Mitt Romney are each trying to project strength on national security. NBCs Peter Alexander reports. After two political conventions and heading into the post-Labor Day sprint, President Barack Obama leads Republican nominee Mitt Romney in the key battlegrounds of Florida, Ohio and Virginia, according to new NBC News/Wall Street Journal/Marist polls of each of these three states. In both Florida and Virginia, Obama is ahead of Romney by five points among likely voters (including those leaning toward a particular candidate), 49 percent to 44 percent. In Ohio, the president’s lead is seven points, 50 percent to 43 percent. President Barack Obama waves after speaking at a campaign rally in Golden, Colo., Thursday, Sept. 13, 2012. Among a larger pool of registered voters, Obama’s advantage over Romney slightly increases to 7 points in Virginia, 8 in Florida and 9 in Ohio. 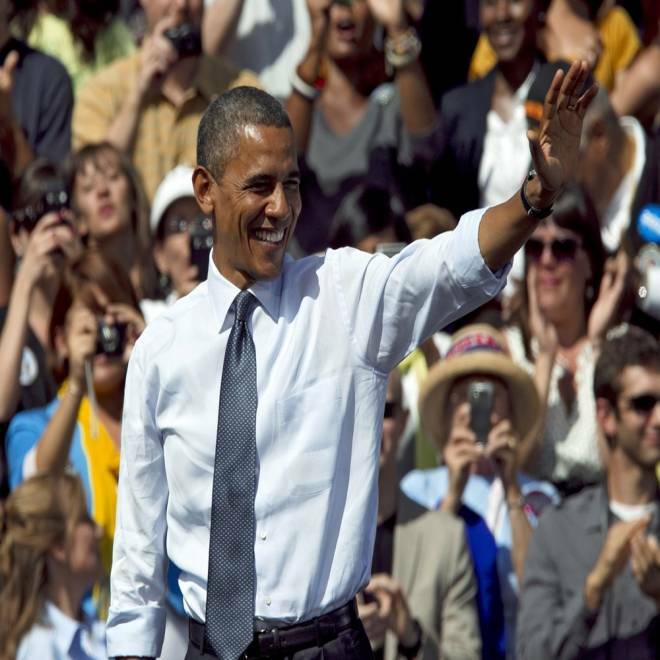 “You’d rather be in Obama’s shoes than Romney’s in these three critical states,” Lee Miringoff, director of the Marist College Institute for Public Opinion, says of the poll results. But he adds that Obama’s leads are not “insurmountable,” especially as the two candidates prepare for their first presidential debate on Oct. 3 in Colorado. 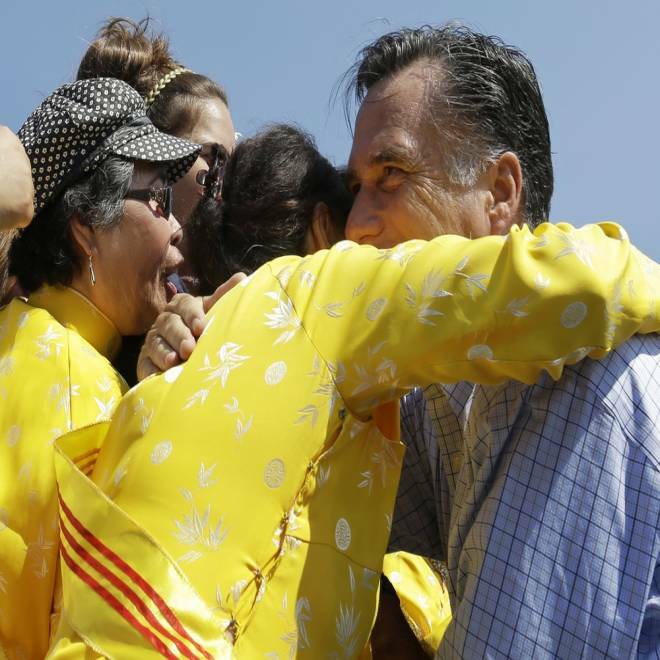 Mitt Romney embraces women wearing traditional Vietnamese "ao dai" dresses as he campaigns at Van Dyck Park in Fairfax, Va., Thursday, Sept. 13, 2012. These states – all of which Obama carried in 2008 but which George W. Bush won in 2004 – represent three of the most crucial battlegrounds in the 2012 presidential election. And according to NBC’s electoral map, Romney likely needs to capture at least two of these states, if not all three, to secure the 270 electoral votes necessary to win the presidency. By comparison, Obama can reach 270 by winning just one or two of these battlegrounds – on top of the other states already considered to be in his column. What’s particularly striking about these polls, Miringoff observes, is how most voters in these battleground states have already made up their minds, with just 5 to 6 percent saying they’re undecided, and with more than 80 percent signaling that they strongly support their candidate. “Those who are thinking of voting have pretty much picked sides,” he says. The Romney campaign is on defense, facing criticism from within the Republican Party, and from President Barack Obama that the GOP presidential nominee politicized a foreign policy crisis. Romney campaign adviser Vin Weber discuses. In Florida and Virginia, Obama and Romney are essentially tied among likely voters on the question of which candidate would do a better job handling the economy, although Obama has a four-point advantage on this question in Ohio. But when it comes to handling foreign policy, the incumbent Democratic president enjoys a double-digit lead over his Republican challenger. Also in the polls, Obama’s job-approval ratings – 50 percent in Ohio and 49 percent in Florida and Virginia – exactly match his ballot position against Romney in these states. And in each of these three battlegrounds, a majority of likely voters say the country is on the wrong track, while more than 40 percent believe that it’s headed in the right direction. 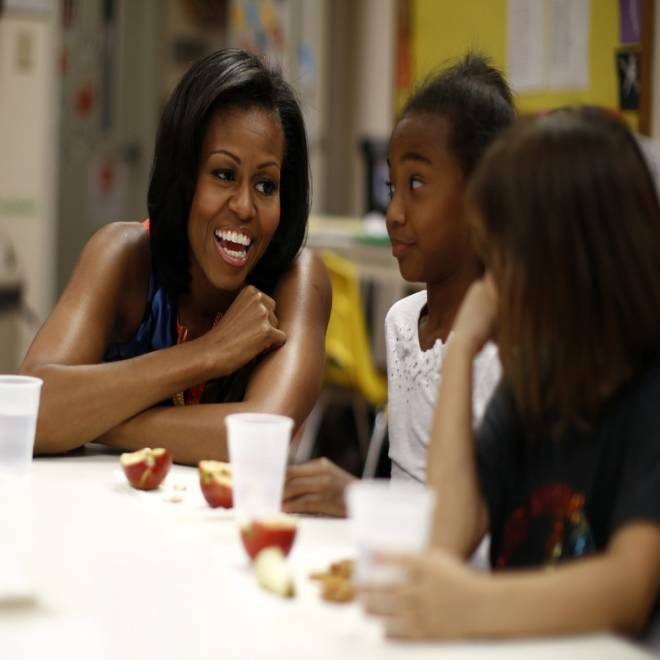 First lady Michelle Obama visits with young children in after-school care at the Rappahannock Area YMCA in Spotsylvania, Va., on Sept. 13, 2012. The polls also measure the key U.S. Senate contests in these three states, all of which could determine the balance of power in that chamber. In Florida, incumbent Democratic Sen. Bill Nelson leads Republican challenger Connie Mack among likely voters by double digits, 51 percent to 37 percent. In Ohio, incumbent Democratic Sen. Sherrod Brown is ahead of GOP challenger Josh Mandel by seven points, 49 percent to 42 percent. And in Virginia, Democrat Tim Kaine and Republican George Allen are tied at 46 percent each. The NBC/WSJ/Marist polls of Florida, Ohio and Virginia were conducted from Sept. 9-11 of nearly 1,000 likely voters in each state (about 30 percent by cell phone), and they have a margin of error of plus-minus 3.1 percentage points. The former Republican Florida governor explains his support for President Barack Obama but says he's not ready to declare himself a Democrat just yet. A likely voter is determined based on interest in the upcoming election, the chance of voting, and prior participation in past elections. More than 1,300 registered voters were surveyed in each of the three states, and the margin of error for those voters is plus-minus 2.7 percentage points.